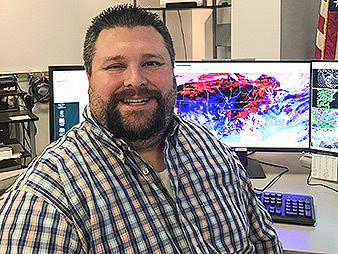 When the federal government shut down twice this year, meteorologist Brandon Dunstan went to work, just like any other day at the National Weather Service office in Raleigh, N.C.
Dunstan, 38, worked 320 hours of overtime in 2017, including a 21-day stint with no days off. He said he gained 15 pounds during the year, rarely finding time to exercise. And when his 7-year-old daughter, Ellie Kate, was asked at school to explain what meteorologists do, she had a quick answer: They sleep. Frazzled and overwhelmed by a chronic shortage of workers, the nation's front-line meteorologists say they have hit a breaking point, struggling to fill shifts and hoping that Washington will deliver some help. Many meteorologists fear the situation will only worsen if President Trump gets his way next year by eliminating another 355 jobs, 70 percent of them forecasters. "The sad truth is, the National Weather Service has already been operating with hundreds of vacancies for several years now," said Mark Pellerito, 41, a meteorologist and union steward at the National Weather Service's office in Binghamton, N.Y. "We can be our own worst enemy in this regard. ... Despite short staffing, we always bend over backwards to get it done. At a point, though, something gives." The National Weather Service says it's planning to ease the burden by hiring more than 80 entry-level meteorologists before April 1. And a new policy has been put in place to expedite the hiring process. But more cuts would follow under Trump's fiscal 2019 budget proposal, which calls for trimming the overall workforce by 8 percent, shrinking it to 4,139 positions (Greenwire, Feb. 13). "We can't take any more cuts and still do the job that the American public needs us to do," said Dan Sobien, president of the National Weather Service Employees Organization, the union that represents the meteorologists. The warnings are hardly new. In October, the union said the agency was "close to teetering on the brink of failure" for the first time in its 148-year history. And last May, a report by the Government Accountability Office depicted a demoralized and stressed-out workforce, with slow hiring partly to blame: Some hiring requests took up to 467 days to process. For many meteorologists, the biggest fear is that the staff shortages will cause them to make a mistake, resulting in missed warnings or delays in recognizing hazardous weather. "In the case of a tornado, minutes count, seconds count," Pellerito said. "And if you have a bunch of meteorologists who've been working day in and day out and are stressed and fatigued and their attention is being drawn in a thousand different directions, and then the warning is a couple minutes late, it could be the difference between you making it to your basement or not." Meteorologists across the country say they've had to work double shifts and cancel days off, vacations and medical appointments. They complain that they've also had to spend more on child care, skip out on their kids' birthdays and school events, and put up with more irritable and short-tempered colleagues at work. "I missed my son taking his first steps," said Brooke Taber, 42, a senior meteorologist and union steward at the NWS office in South Burlington, Vt. "My wife sent me a video. She goes, 'Look, Austin's taking his first steps.' I was a little disappointed that I missed it, you know. I was putting my job ahead of my family." Taber said the office functioned last year at one point with 46 percent of its normal operational staff, down seven meteorologists. While a couple of new hires arrived in December, he said the office has not been fully staffed since September 2012 and that workers picked up more than 1,500 hours of overtime in 2017 to plug the gaps. "Personally, it strained my relationship with my wife," said Taber, who lives in Milton, Vt. "I have two little boys. ... And I speak for the whole staff: It's extremely hard on the work-life balance and trying to be a functional parent because we're so short-staffed." 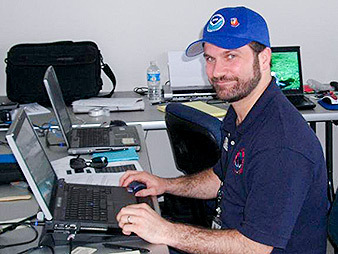 Ray Martin, a 36-year-old senior meteorologist and a union steward at the NWS office in Sterling, Va., said he hasn't asked for any leave in six months and that he worked all the holidays because he's single and wanted to help colleagues with children get time off. Martin said the Sterling office, which serves more than 10 million people in the Washington-Baltimore region, has been operating with 10 of its 15 full-time forecasters, forcing schedulers to let many shifts go unfilled. But he said three more meteorologists have been hired and will come on board by the end of March, leaving the office two short. He figures the Sterling office is getting treated better than most because it serves the nation's capital but said he's "dismayed" at the prospect of more cuts. While the Sterling office awaits its reinforcements, Martin said he added nearly $20,000 in overtime pay to his base salary of $93,000 last year, working a 16-day stretch at one point. He said he sometimes sleeps only four hours per day, relying on eight to 10 cans of Diet Pepsi to make it through a shift. "I consume Diet Pepsi by the gallon," Martin said. "It can be dangerous sometimes when you're out on the road, late at night or early morning, trying to get home from a long shift, and all you want to do is be in bed." As the Binghamton office scheduler, Pellerito said he had to leave one of every eight shifts unfilled in 2017. He said the office is down six of its 18 positions and that workers logged 1,400 hours of overtime in 2017 to help make up the difference. He ended up working 256 hours of overtime during the year, including 12 consecutive shifts over the holidays. "These days, when any of us seek any time off work, or even just get sick, we are put in the awkward position of forcing our co-workers and friends to stay behind and work in our place, to cancel plans or to work double shifts," said Pellerito, who lives in Endwell, N.Y. While Trump wants to get rid of 248 meteorologist jobs next year, they're all considered "essential" positions, at least in government parlance. That means they're too valuable for the workers to stay at home when the government closes due to an emergency. And that's why Dunstan, the Raleigh meteorologist and union steward, reported to work during the 16-day government shutdown in October of 2013 and again during the shorter closures this month and in January. He said the office is still down four of its 13 meteorologist positions, so he doesn't like Trump's new budget proposal. "Given the amount that I've already worked in the last year and this year, I'm not wild about that, obviously," said Dunstan, of Holly Springs, N.C., who has worked at the Raleigh office since 2005. "It's just kind of gotten worse over time." Dunstan said he's hoping that things will ease up soon so he can get the time to exercise and spend more time with his family. "I literally went in at 2:30 yesterday and worked all the way till 4 a.m. this morning," Dunstan said last week. "I don't know what's going on tonight, because we've got another individual that is sick on the overnight shift — and I'm on the evening shift." 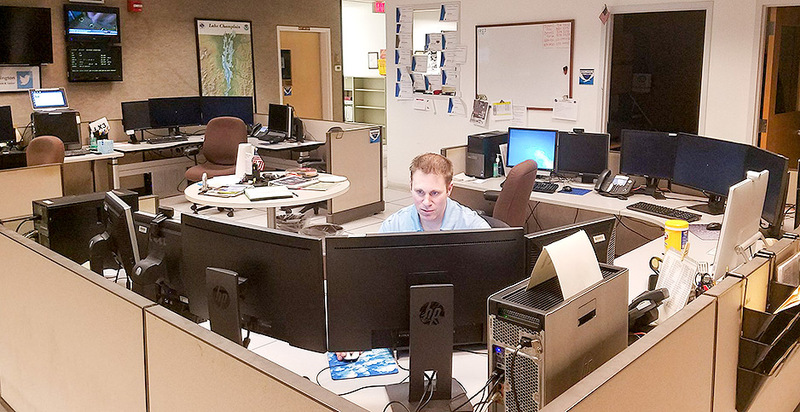 In Alaska, one NWS worker in a remote office in McGrath, Alaska, worked 145 consecutive days last year, said Jim Brader, 52, a meteorologist and union steward in Fairbanks. He said the agency also decided to suspend some of its planned launches of weather balloons, which are used to record weather data in the atmosphere. With the office down three forecasters, Brader said, meteorologists in the Fairbanks office have been forced to work overtime and then been denied leave. He said some of his colleagues had to miss graduations last year, while he was unable to take time off to attend a summer family reunion. "When people can't take time off, especially to go to family functions, it really drops the morale," Brader said. "And it's not just that we don't get our time off — when someone's sick, there's no one to cover." Susan Buchanan, acting director of public affairs for NWS, said the agency is actively recruiting to fill vacancies in Alaska and across the country but that the Fairbanks office "poses unique recruitment challenges." Trying to get a handle on the actual number of vacancies in the agency's 122 forecast offices can be tricky. The GAO report last year said the vacancy rate in units that issued forecasts and warnings rose from 5 percent in 2010 to 11 percent in 2016, going from 211 to 455. It said the agency's backlog was partly due to a hiring freeze and budget sequestration approved by Congress. Sobien said the number of overall vacancies has grown and now easily exceeds 600. And he said Trump's budget proposal would force the agency to close some offices at night or on weekends, further risking public safety and causing more damage to employee morale. "With the roughly 600 to 700 vacancies that are out there right now, it's already causing all kinds of morale problems," Sobien said. A Department of Commerce spokesman, speaking on background, said the number of vacancies has declined to 305 and that the agency has implemented a new human resources policy aimed at expediting hiring. That includes speeding up the approval of security clearances, he said. The agency also wants to lure more external candidates. And if the president's budget cuts are approved next year, the spokesman said, the agency will begin "a series of operational reforms aimed at increasing staffing flexibility." Scheduling has already become a key issue in Fairbanks. Union officials complained last week that the union's relationship with management hit a low when they discovered that workers not only were being denied leave but were then told by management that they would lose their accrued time off under a "use it or lose it" leave policy. Sobien said union and management representatives have been at loggerheads for months as they try to negotiate a new contract. He said he was outraged at a January negotiating session when the NWS chief negotiator asked what workers do during their midnight shifts "besides sleeping." "It shows the lack of respect," Sobien said. Buchanan said the contract talks will include negotiations over alternative work schedules that now allow workers in Fairbanks to fit their 80 biweekly hours into nine days, allowing them to have an extra day off every two weeks. She said the alternative schedules do not give managers enough flexibility to fill all shifts when the office is short-staffed. "Unfortunately, the union would not agree to adopt a traditional work schedule until the office's vacancies are filled, even knowing this decision meant potentially more overtime and reduced leave opportunity," Buchanan said. But looking ahead, she said that both NWS and the union want to work together, aligned in "providing America with exceptional science and service."